Beautiful artichokes are one of my favorite vegetables, especially the baby ones…they’re small, tender, and make beautiful and delicious dishes. The only draw back is the preparation, and trimming, since it can take some time to remove the hard leaves and trim them, some people prefer to use easier to prepare vegetables. In French we say, quand on aime on ne compte pas, when you love, you don’t count, which is somehow the way I go along withe life and cuisine in general. What count is the result, not really the time spent in the kitchen (obviously when you have time). The great thing about California, is that you get many fruits and vegetable locally grown so that availability of fresh and organic produces is huge. In France we have similar baby artichokes but they’re purple and are called artichauts poivrade, very popular in the South of France, Italy and Spain. My mom always brings form Italy cases of artichokes from my uncle’s garden, she keeps them half-cooked in jars, filled with olive oil, garlic and herbs and uses them to put on top of pizza or to eat as is as antipasto, with prosciutto. Those can be preserved that way for over 6 months and are delicious, crunchy, full of flavors since they’re infused in olive oil and herbs. The other wonderful ingredient in this recipe is the Farro (or spelt), it’s the Italian name of the grain, also used in English. In France it’s called épeautre and is one of the oldest grain, very rich in protein and cultivated in Italy at the foot of the Alps in a region called Garfagnana. It is a very robust plant that grows in tough climate and is resistant to cold, therefore, its culture does not need pesticides and other chemical such as wheat does, that’s why Italian farro is a part of organic agriculture. Cook farro in 3 times its quantity of water for about 20-25 minutes. Drain and set aside. Trim the artichokes removing the outside leaves and cutting the tip of the heart to keep just the tender and yellowish heart. Cut in quarters and place in a bowled filled with water and lemon juice to prevent the artichokes from darkening. Saute artichokes with garlic in olive oil, stir and add white wine, salt and pepper. Cover and cook until the artichokes are tender. Saute shrimps in olive oil salt and pepper. 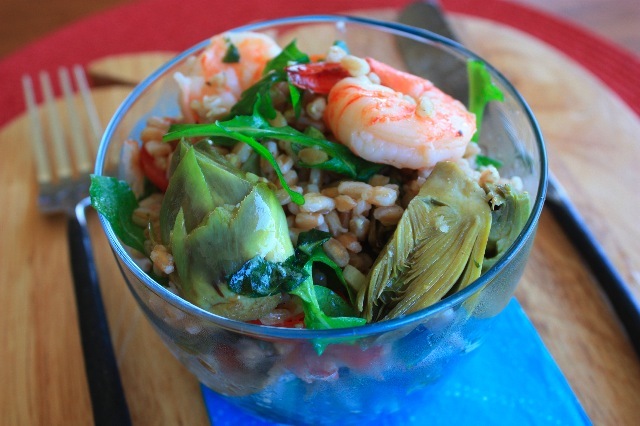 In a salad bowl, mix farro, artichokes, shrimps, let it cool a little, then add tomatoes and rucola. For the vinaigrette, mix all ingredients together, mix well and add to the salad. Toss and serve. This entry was posted by silvia on May 26, 2009 at 6:08 pm, and is filed under Appetizers, Fish/Seafood, Grains, Salads. Follow any responses to this post through RSS 2.0.You can leave a response or trackback from your own site. Farro is not easy to find where I live, but I appreciate it whenever I can get a hold of it. This salad looks wonderful! Your mother sounds like a wonderful cook – I think I would have enjoyed growing up in your house. Looks good. Thank you for sharing. Cheers !